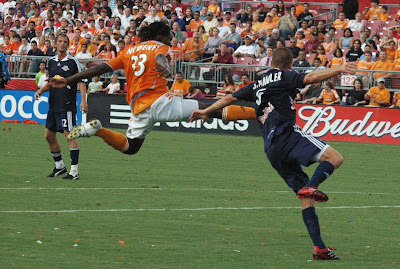 Joseph Ngwenya (33) scores one of his two goals against the New York Red Bulls. HOUSTON, TX (July 5, 2007) On a game evening that saw the clouds clear for a bit and allow the blue sky to show through, the Houston Dynamo, on the leg of forward Joseph Ngwenya, downed the New York Red Bulls 4-0 at Houston’s Robertson Stadium. The 14,072 fans in attendance saw the Dynamo take command of the game and never relinquish control to the Bruce Arena lead Red Bulls. Ngwenya found the goal first for the Dynamo, taking an assist from midfielder Stuart Holden in the 28th minute to make the score 1-0. Forward Brain Ching came back three minutes later with an unassisted goal to give the Dynamo a 2-0 lead. Red Bulls defender Kevin Goldthwaite was issued a yellow flag from a professional foul in the 27th minute. To start the second half, Ngwenya again found the goal off a corner kick by Holden, who was also credited with the assist in the 50th minute. The goal was the fifth of the year from Ngwenya. His goal gave the Dynamo a 3-0 lead. Holden then found the goal to take the score to 4-0. The assist was provided by forward Nate Jaqua, whose assist was the first of his career for the Dynamo. Jaqua, who is a MLS All-Star, was obtained on a trade with the Los Angeles Galaxy for midfielder Kelly Gray on July 3. The Honda MVP of the Game was awarded to Joseph Ngwenya.